We've said it many times and we will say it again. We really like EMA Espresso Bar and we knew we would like it from the day it opened in June 2013. 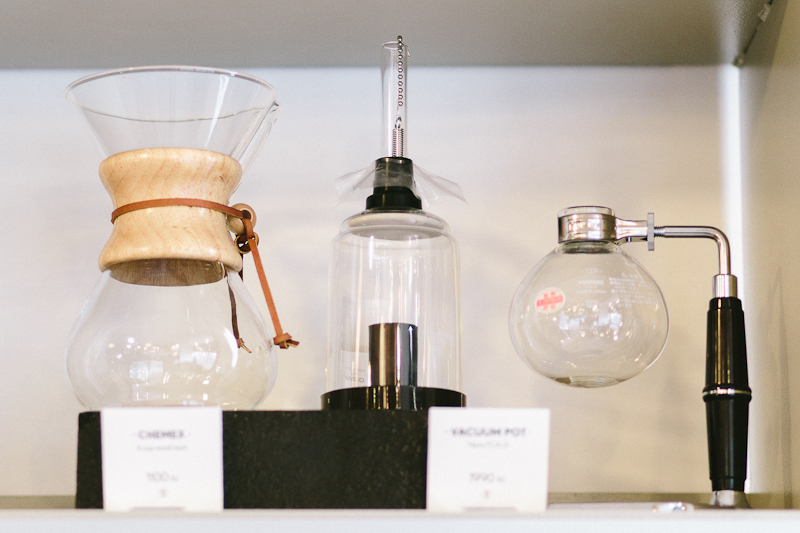 In its heart, EMA is an espresso bar: a place to get delicious coffee to go or to stay. But it's more than just that. In addition to the coffee - and they do both espresso-based drinks and drips using coffee from at least two roasters every week - EMA offers great Czech baked sweets (like various kolachees or sweet yeast buns with curd cheese that Jan tends to order more than he should), one or two salads and sandwiches, lemonades made in house or sodas by Fritz Cola, and even some wines supplied by Veltlin. EMA also added a daily soup to their menu a few weeks ago, and has began serving community table-based breakfasts on Saturdays. What really makes it our favorite spot to grab a cup of coffee despite the sad lack of wi-fi (otherwise a standard in Prague cafés)? Is it the airy interiors with lots of natural light? The decor that is at once modern and reminiscent of the 1930s Czech functionalist architecture? Or the delicious coffee we order there on a daily basis? No, our favorite thing about EMA Espresso Bar is the friendly atmosphere, partly created by the team of their skilled baristas. In today's edition of the "Meet a Local" series, we bring you the views of the two baristas we chat with the most every time we get to the bar: Adam, who is also the manager, and Vojta, who creates fantastic latte-art on our cappuccinos and flat whites. How would you describe Prague style? Adam: A nice coffee scene has been developing in Prague recently. If you know where to go, Prague has many really nice cafés you can visit, each of them unique in terms of design, each of them with their style of coffee and each of them diminutive in size, so they have to make quite an effort to survive :-) In my book, these include I Need Cofee, Pražírna, Můj šálek kávy, Café Jen, Ema, Cafe Lounge, Mezi zrnky, Monolok, Bistro 8 etc. Awareness about coffee has been on the rise among both baristas and guests, which is probably the best scenario. Vojta: Answers.. usually will bring more questions. I think it is quite difficult to define "Prague style". It depends on daylight, season, time and place, where you are. Because people in Prague, especially in winter, wear lots of black and grey... and the grayness is everywhere. But its going to get better:o). Where do you go in Prague to be inspired? A: For me that would be cafés. I like places where you can sit down by yourself and relax, have your own private space but be in the centre of the action. For me, such a place is the bench in front of the Vescovi Café in the Újezd area under the Petřín hill. V: When I need inspiration, I usually walk through the city and near the river.. or I just sit in some pub alone, but not alone: having many people around is the right atmosphere for me. Three favorite places in Prague? A: I generally like places with some trees and greenery. That's why i like parks, the Vyšehrad fortress which has remained a place that only a few tourists know about, and the Lesser Town for its narrow streets and the aura of ages long past. V: Three favorite places in Prague are: (1) the Charles Bridge at 4 or 5 am in the summer when the sun rises; (2) crossing the Bridge of Legions in the Ujezd direction drunk at night during a drizzle; (3) and actually about 50% of Prague – that's my last favorite place.. You cannot really tell a favorite place. Each of them is nice at a different time and in different weather. What’s your secret shopping address? A: The farmers' markets at the Jiřího z Poděbrad square. V: When I tell you my secret shopping address, it will not be a secret anymore! But it's at the same address as my favorite clothing brands: Carhartt, iriedaily etc. The best place for romantic/weekend/with friends dinner? A: Rest, ideally in their outdoor seating area in the summer. Where do you like to grab a drink? V: If you would like to grab a drink, definitely visit the Hemingway Bar, one of the best cocktail bars in Prague. Or Hoffa, a bit noisy but new, clean and friendly. A: The surroundings of the Karlštejn castle or the small garden in the courtyard of Coffeesource. V: Best relax? Doesn't matter if it's in Prague or anywhere else.. it will be in my bed.. anytime, anywhere. A: Café Jen, Cafe Lounge. Top three things that every traveler to Prague should do/see? A: Have a cup of coffee at EMA, the farmers' markets and the flea market on the river embankment and then renting a paddle boat on the Vltava river.